Every month (or year) there’s a book that you see so much about before it’s even out in the world. The second book by Sally Thorne, author of THE HATING GAME, was one of those books. Her debut was on many favorites lists. So when we got the opportunity to chat with her about her second book, we couldn’t pass it up and can’t wait to share with you. 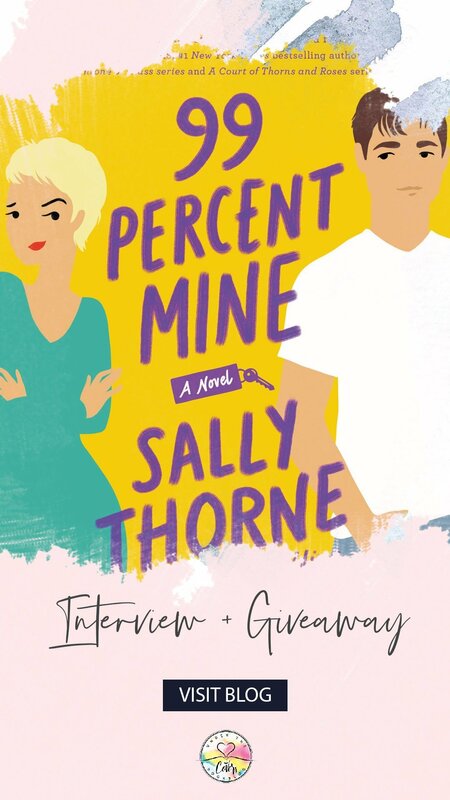 Lets give her a warm welcome to Under the Covers and learn more about 99 PERCENT MINE! Welcome to Under the Covers, Sally. We are very excited to be chatting with you today about 99 PERCENT MINE. Thank you for being interested in me and my book! How would you describe this book in a tweet? A bad-girl called Darcy Barrett gets a bad case of the lust-sweats whenever her twin brother’s best friend, Tom Valeska, is in a 50-mile radius. Tom arrives to renovate Darcy’s cottage. She tries not to touch his muscles or gnaw through his bedroom door. She doesn’t try TOO hard. This is your second novel, following the huge success of THE HATING GAME. Did that make it easier or harder to write it? So much harder that I want to shake you by your lapels shrieking HARDER! I’ve never intentionally written a book before, I’ve never experienced success and I’ve never had anything to follow up. THE HATING GAME felt like a fluke to me. I couldn’t tell you how I wrote it. All I knew was, I had to do it again. Countless people told me: Loved your book! Can’t wait for your next one! I was a shaky newborn author and I was intimidated by their cheerful faith in me. I was reliably informed by knowledgeable people that Second Book Syndrome is very real and it’s a confidence killer. I had a false start on a project that I couldn’t complete, but my publisher was lovely and patient. I stared at a blank Word document for a very long time and began to pick listlessly at my keyboard, until the title 99 PERCENT MINE randomly came into my head, gave me goosebumps and my synapses blazed to life. About time! But even then, it didn’t come easy. This book was nothing but blood, sweat and tears- and the weirdest part is, it was just me versus myself. How did the inspiration for this story come about? I was thinking about tropes I love, and I’m a sucker for ‘brother’s best friend’. Usually the guy is trying to keep his hands to himself, so I wanted to try a twist on it: a bad girl and a good boy. I wanted to create a woman who says what she thinks (Darcy Barrett) and a genuinely lovely, good man (Tom Valeska). We can’t forget twin brother Jamie, who likes to control and complicate, and make everyone laugh. Also, fun fact, my mother is a twin. Another inspiration was that my parents are renovating a house that means a lot to our family, so I gave the Barrett twins a dilapidated cottage that only Tom can save. My absolute favorite part of writing is that just sometimes, when a blue moon is high in the night sky, I enter a state of creative flow. It feels like I’ve hooked my brain up to the computer and started downloading. I stay up past three A.M until I physically can’t do any more. When I read it the next day, it’s like another person wrote it, but it’s exactly the sort of thing I like: heavy sexual tension, weirdness, happiness and sadness. The hard part follows: letting another human read these late-night downloads. If you could pick a theme song for Darcy and Tom what would it be? Music really helped me through the worst of the writer’s block. Call It What You Want by Taylor Swift is a good song for Darcy and Tom. It’s January so we all love making lists about things we’d like to do and achieve. What would be on your bucket list dream vacation? I really want to go to Korea. I love K-Dramas, skincare and shopping, plus countries that are a mix of new and old- so I think I need to be there. If you could be best friends with one character (from any book – not yours) who would it be and why? Bridget Jones- I feel like she’d completely ‘get’ me. In my daydream we’re wearing matching flannel pajamas that make our butts look massive. We eat three different types of takeout, minimum. She’d tell me about Mark Darcy and what his neck smells like. We’d fall asleep on the couch with face masks on, then wake up at three A.M and watch Informercials. We call the number to buy whatever they’re selling- a fancy mop, or chakra-aligning crystals- but our credit cards would be declined. Probably for the best. I’ve signed another two-book contract with HarperCollins which is incredible and I’m so grateful for this chance to live my dream. I’ve wanted to publish a book since I was a kid. I’m working on the first draft of my third book, which I’m glad to say is going much easier- Second Book Syndrome is hard, but it’s survivable. Thank you Under the Covers! The writing process is my favorite part of this interview….I can only imagine! I’m sorry .his was harder to write, but it sounds so good, I can’t wait to read it! Congratulations! Loved the interview! I can’t wait to read the book! Love that Taylor Swift song. Also, I’m so glad we have two more books to look forward to. I shall try to be pastient. A great post thank you. Caught my attention. Thanks for the interview. I always enjoy reading the brother’s best friend trope. love that cover, so cute!! Great interview! I enjoyed reading about the author’s inspiration. It is always interesting to know how the author came up with the idea for the story. Great interview! I’ve been looking forward to reading this one for a while! 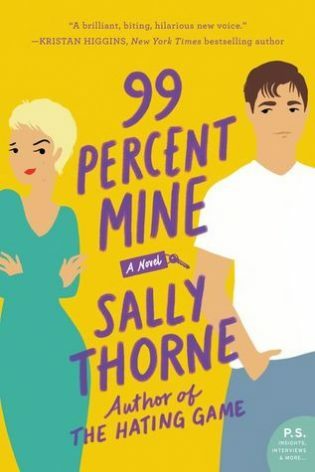 I loved The Hating Game and can’t wait to read 99 Percent Mine. 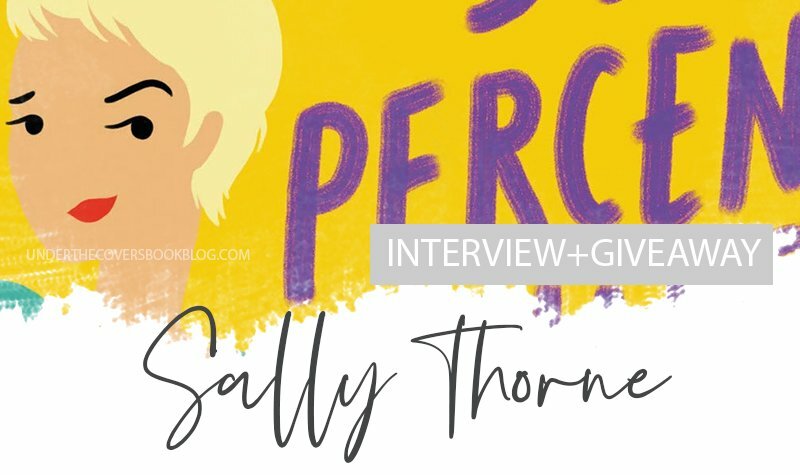 I loved this interview too – I can only imagine the pressure on a second book after such a successful first one – thank you to Sally Thorne for fighting the good fight to bring us more! This sounds really good! The Hating Game has been on my to-read list a while, and I’ll be adding 99 Percent Mine too. This book sounds fun. I just adored The Hating Game. Such great dialog between the characters. Bridget Jones as a friend would be fun. I would say Doctor Who for my choice. I love the behind the scenes of the writing process and “gnawing through his bedroom door’ made me LOL! I loved this interview! I can’t wait to read her next two books (and any others she may write). Good interview! That cover is soo cute!! I loved The Hating Game, and this book sounds like another delightful story. I love the cover and I loved The Hating Game! Can’t wait to read this one! Great review. I haven’t read any of her books yet, but the synopsis is very interesting! I can’t wait to read it. I cannot wait to read this! Hating Game was my favorite book I read in 2016 and have reread it since. Loving 99 Percent Mine! <3 So glad Sally is continuing to write! Loved the interview. Especialy the writting prosess part. I loved Ms. Thorne ‘s first book. I really am looking forward to reading this one. Sad that it was a struggle for the writing process, but hopeful that the third book will come out sooner. Thanks for the interview, UTC!